Negotiation may seem, at first sight, like something that other people do. High-powered business people, politicians and union leaders negotiate. But, what they are doing comesdown to bargaining, and all of us do that. When you bargain, and bargain successfully, you can smooth relations and save money, time, aggravation and face in many differentsituations.In Negotiation Skills for Rookies you will learn skills and gain insights that will help you to:• Have business-like discussions with colleagues, clients and suppliers.• Develop sound, effective communication techniques.• Understand the role of negotiation in business.• Orchestrate a range of different skills appropriate to the circumstances.• Work around and with other people’s requirements in order to get the result you want.Whether you have some negotiating experience already or are an outright beginner, this book expertly and simply explains the core techniques and essential principles and warns you of the pitfalls. With its straightforward and easy-to-apply guidelines, some determination and practice, you too can learn just how to get what you want – and get itin the best possible way.Low-Budget Marketing for Rookies is a simple and practical guide to marketing on a shoestring. Whether you have some experience already or are an outright beginner, thisbook will explain the basics and warn you of the pitfalls. You don’t need bottomless pockets or a university education to be a successful marketer. 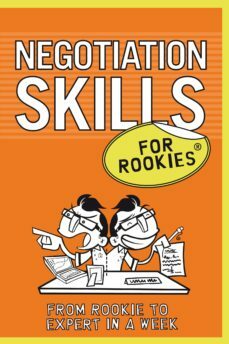 What you do need is somestraightforward and easy-to-apply guidelines, a dash of common sense – and this book!Whether you are new to work or already have years of experience, Job Hunting for Rookies has clear and straightforward lessons to transform both the way you think about your abilities and how you present them to an employer. Complete with an insider’s guide to the “super six” answers all interviewers ask, this is an unbeatable guide to getting the job you’ve always dreamed of.